Cyberpunk adventure, a clever take on dystopia, a brutal Metroidvania, and a VR game that doubles as a documentary. Enjoy these bite-sized reviews. 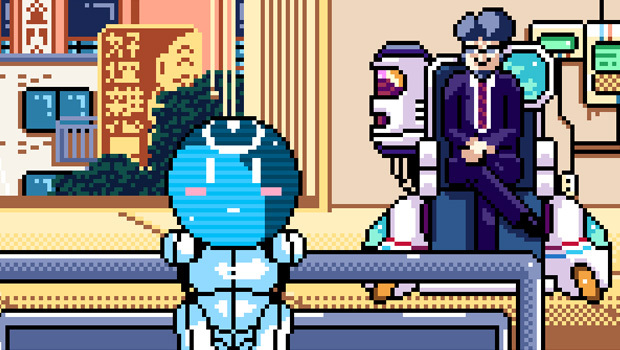 2064: Read Only Memories is something of an anachronistic oddity: it’s a retro-styled point and click adventure game, set in a cyberpunk future, that deals with decidedly current issues like identity and privacy in a digital age. That makes for a compelling adventure, only made better by a star-studded voice cast and fantastic writing. Turing, a robot companion voiced by Melissa Hutchinson (Clementine in The Walking Dead), is a particular delight. It’s nice to queer characters represented in great number and without prejudice. There’s a place for games to explore real issues around bigotry (Masquerada: Songs and Shadows does this well), but Read Only Memories is content to show a utopian vision of a world where queer people can be safe, can be happy, can exist. That’s a really nice thing to have in a medium where we rarely get to be anything more than talking point for queer issues. Beautiful as the pastel-coloured pixel art is, I don’t think the retro inspiration serves the game well, for one simple reason: it’s clunky to play, especially on console. You don’t have to move an on-screen mouse about, at least – you cycle through interactive objects using d-pad – but it’s still hard to keep track of what’s going on and what you’re looking at. That’s made worse by tiny navigable space for each area, because half the screen is reserved for text boxes and menus. Nostalgic? Certainly, but far from user friendly. Menus are particularly clunky; even something as simple as saving the game is an unwieldy, unintuitive process. If you can overlook those problems, though, you’ll find a very enjoyable cyberpunk adventure. Typoman Revised is a puzzle platformer with a unique hook: in order to solve puzzles, you need to use letters strewn about the environment to spell out words. Activating a switch – a cornerstone of puzzle platformer design – doesn’t involve simply hitting it, but finding the letters “O” and “N” and bringing them together next to the switch so that you can spell “ON”. Harder puzzles naturally involve longer words, and there are often multiple solutions by using different synonyms. It makes for puzzles that get rather fiendish, and challenge your vocabulary as much as your logical thinking and problem solving skills. 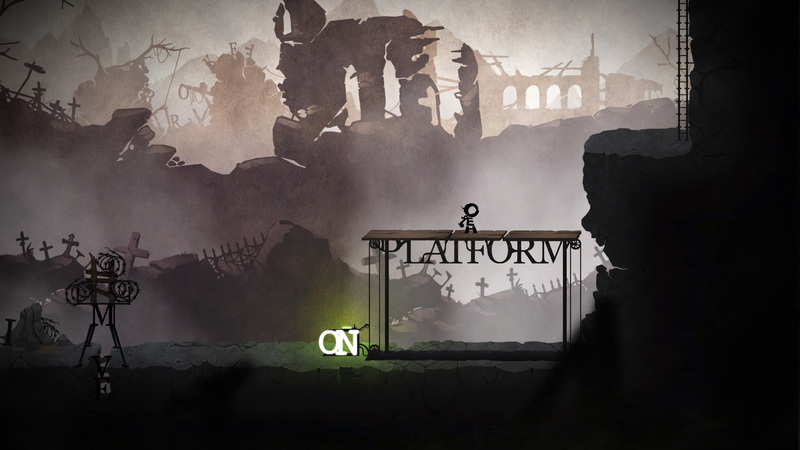 Letters aren’t just used for puzzle solving, but are key aspect of Typoman’s unique visual design. Almost everything you interact with, and much of the scenery, is made of typography. Ladders consist of long strings of Hs, levers are formed with the stem of an L, and the T in “GATE” forms many a door that needs to be opened. The game’s hero is made of the word HERO shaped into a humanoid form, and many of the dangers they face are similarly stylized words, like “CRAWL” in the form of a scorpion and “DOOM” in the form of a strange insectoid creature. It’s a very clever idea, and executed brilliantly. The backdrop to all of this is a world that appears to be ravaged by war. Crumbling buildings and barbed wire fences form much of the scenery, while bombs fall in the distance and smoke billows. It’s horrible and at times scary, but mostly, it’s just really bleak – deliberately so. There’s little by way of overt plot, but the environment and puzzles tell an important story about the cost that war has on language and culture. Here’s a world where the English language is quite literally being torn apart, seemingly by alien invaders; how many other languages, in the real world, have been lost to colonialism? It’s a sobering thought, and one that Typoman delivers quite eloquently. I really want to like Hollow Knight. It’s a Metroidvania – the best game genre – with a beautiful monotone art style, an intriguing world, and clever level and encounter design. The whole game just oozes atmosphere that creeps in under your skin, grabs hold, and doesn’t let go. 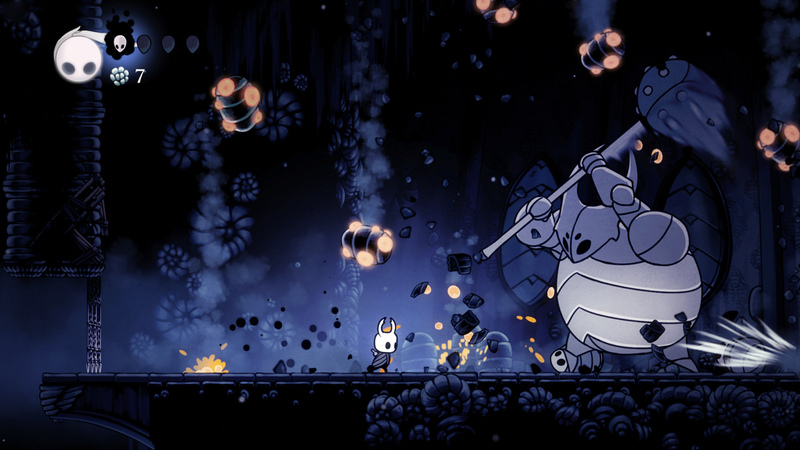 It’s difficult, checkpoints are rare, and the map system is arcane, but all of these things that I’d normally rail against come together in Hollow Knight to make death, failure, and confusion a key part of the experience. Unfortunately, Hollow Knight has one problem that’s big enough to be a deal-breaker: the controls are unreliable to the point that the game is nigh unplayable. There’s a noticeable lag between pressing a button and the action happening on screen, inputs often just don’t register at all, and sometimes your character decides to keep moving even after you let the button go. I’ve tried different controllers and different display units, and I get the same result every time. This is frustrating enough in any game, but it’s particularly bad in something like this, that demands precision platforming that simply isn’t made possible by the control scheme. Your mileage may vary (I’ve seen quite a few reviews praise its “tight controls”), but my experience and that of seemingly quite a few other people on the Steam forums, the shonky controls ruin what would otherwise be an amazing game. Time Machine VR is a fascinating combination of game and documentary. It casts you as a time traveling researcher, tasked with analyzing and cataloging aquatic dinosaurs in pre-history. This isn’t just for interests’ sake, interesting though it is; the bigger goal is to find a cure for a plague that’s on the cusp of wiping or humanity. 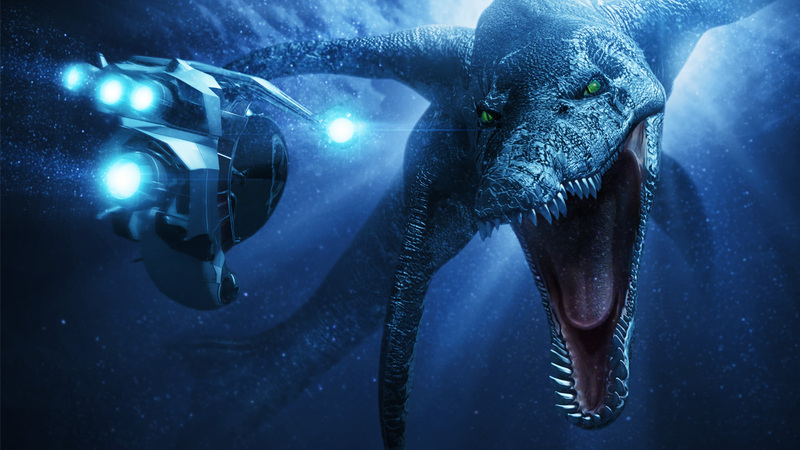 It’s not the most original or captivating story, but it frames what Time Machine VR does best: send you to the bottom of a prehistoric sea, to investigate gargantuan beasts while trying to avoiding being eaten by them. It’s a mesmerizing, occasionally terrifying experience. The immersive quality of virtual reality drives up the atmosphere quite substantially; it’s easy to get lost in the submarine scenery, only to have a huge creature sneak up in your periphery and give you a heart attack. There’s a gamey element making the most of your ability to stop time – which you can use only for short bursts – to safely get close and investigate. But the real draw in Time Machine VR is the experience of just floating through a sea of long-extinct creatures, taking in the sights , and learning something along the way.